Villa Madeira is Florida's Perfect Vacation Resort! Condo 501 is located on the southwest corner of the building. Located minutes from St. Petes/Clearwater Airport, Villa Madeira is located in the center of Florida's main attractions: Epcot Center, Walt Disney World, and Busch Gardens. The vacation condo features three walkouts to a spacious 60 feet of screened-in, 'L' shaped balcony. The balcony is located on the southwest corner which provides you with full sun from morning to beautiful sunset. The condo is located on the 5th floor of a 6 story building. 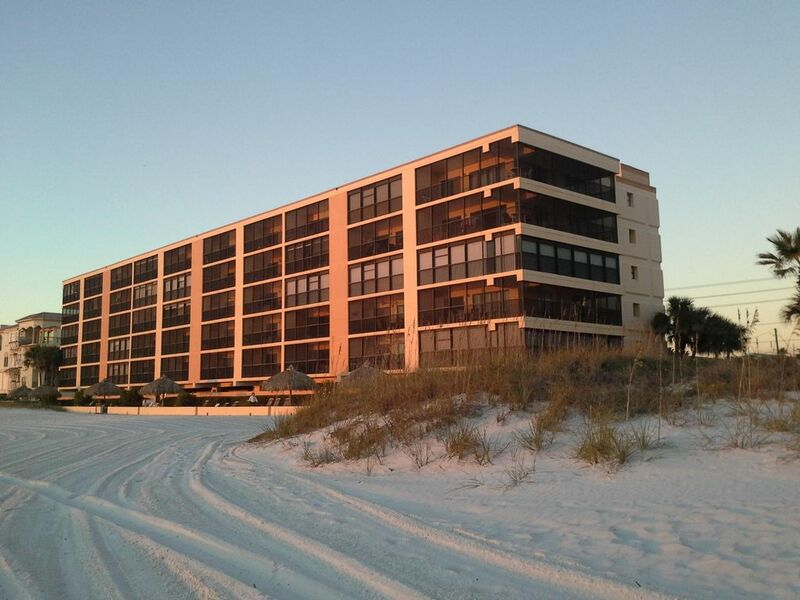 This unit overlooks the Gulf of Mexico, a salt water heated swimming pool, located right below the balcony, a huge clean, white sandy beach, clear shallow waters, and a beautiful sunset. This corner condo provides a wonderful experience for everyone in your family. Sorry pets are not allowed. The master bedroom has a king-size bed, double vanity, new walk in shower, cable HD TV, and a private walk-out to the balcony. The second bedroom has two new XL twin beds and a full adjoining washroom. The third separate bedroom has a double bed. There is also a queen size blow up matteress. For your safety there are handle bars in both baths. The living room is comfortably furnished with two new reclining leather sofas. With a *47 inch big screen cable HD TV, VCR, STEREO, DVD and a telephone with an answering machine. You also have a private, covered parking spot by the security lobby. There are security gates to the pool and the beach. There also is a baby highchair & playpen/sleeper in the condo. I am a handyman by trade. I enjoy playing competive tennis and golf. The condo offers amazing views, and the location is perfect! Wonderful sun exposure from morning to sunset. There are three walkouts to the balcony. With cushion loungers, love seat and ottomans. Great place to stay. Condo was pretty much perfect. We found the end unit could get noisy being so close to the pool. But the morning sun and cross breeze are so worth it.